This month, NGC led the way at the Heritage Auctions World Coins and Ancient Coin Signature Auction event in Hong Kong. The extremely rare 1989 Dragon & Phoenix Pattern Gold 200 Yuan, graded NGC PF 69 Ultra Cameo, realized an astonishing $408,000 USD. The obverse features the Great Wall and the reverse showcases a dragon and a phoenix on the reverse. 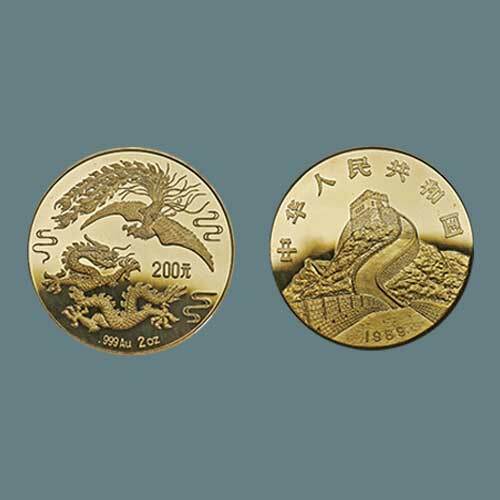 It is struck in two ounces of .999 fine gold and is 40 mm in diameter. China released the famous 1990 Dragon & Phoenix coins in four denominations: a silver 5 Jiao, a gold 10 Yuan, a silver 20 Yuan and a gold 200 Yuan. The 200 Yuan had the lowest mintage of all, about 2,500 pieces. Patterns struck with a 1989 date exist for all four coins, and are all extremely rare. Only three are known for the 1989 Gold 200 Yuan, which is considered the most valuable according to the Gold and Silver Coins of China Standard Catalogue by King Chan, Leo Wang, and Jerry Lin. The $408,000 price is the highest realized through Heritage Auctions for any modern world coin in recent years except for a gigantic 2008 Beijing Olympics 10-kilogram Gold 100,000 Yuan, which sold for $575,000 in 2011. The second-highest price realized in the Heritage Hong Kong sale was a vintage coin, also certified by NGC, that realized $240,000. The 1897 Kiangnan L&M-210 Plain Edge Proof Dollar, graded NGC PF 65, features a superb strike and is one of only two plain edge patterns certified by NGC. Another Chinese coin from 1897, an Anhwei L&M-196, Y-45 Silver Dollar, graded NGC MS 66, realized $192,000. The NGC Chinese highlights continued with a 1907 Gold L&M-1024 Small Clouds Tael, graded NGC MS 63, that sold for $150,000. This coin is encapsulated with the NGC Red Dragon label. In all, five of the top six coins in the auction were certified by NGC, rounded out by an 1889 Kwangtung L&M-124, Y-197 50 Cents, graded NGC SP 67, that sold for $102,000.